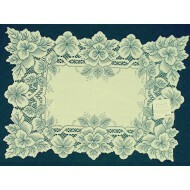 Heirloom 14x20 ecru placemat Heritage Lace. This is such a lovely placemat or can use as a doily. Casual and easy-care for everyday; versatile Heirloom adds elegance to special occasions. Inspired by an antique European handkerchief of fine linen edged in lace, Heirloom has a timeless look -- fabric artfully edged with intricate floral elements and deep-cut, leafy edging and scallops. This pattern is the new pattern that Heritage Lace makes. Color: Ecru which is basically the same as ivory. Care: Machine wash cold-gentle cycle. Do not bleach. Lay flat to dry. Touch up with a cool iron if desired.